Easels holds a variety of items such as books, platters or plaques. 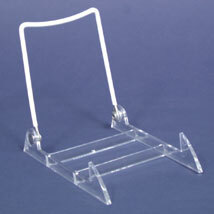 Adjustable stand provides the perfect display on countertops, in displays cases or on shelving. Simple design showcases merchandise or collectibles without interference due to the low angled profile lip.